Author, historian and professor Dwayne Mack, Ph.D., will present an African American History Month lecture, “Black Women in Spokane: Emerging from the Shadows of Jim and Jane Crow,” on Thursday, Feb. 15, at 7 p.m. in Weyerhaeuser Hall’s Robinson Teaching Theatre, Room 107. Mack is the Carter G. Woodson Chair of African American History at Berea College. He was born and raised in Brooklyn, N.Y. He earned a bachelor’s degree in history from Methodist University, a master’s in American history from North Carolina Central University, and a doctorate in American history from Washington State University. His research focuses on the Black West, the civil rights movement, policing in America, and equity, inclusion and diversity in academia. 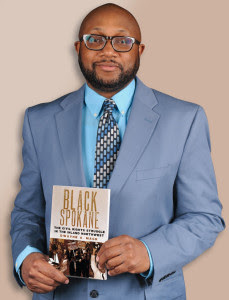 Mack is the author of Black Spokane: The Civil Rights Struggle in the Inland Northwest (University of Oklahoma Press, 2014). In this presentation, Mack will focus on the agency of African American women in the Inland Northwest’s largest city and explore the intersections of racism and sexism in the city during the 20th century. This lecture is open to the public, and admission is free. For more information, please call (509) 777-4215. Mack is the co-editor of Violence Against Black Bodies: An Intersectional Analysis of How Black Lives Continue to Matter (Routledge, 2017) and Law Enforcement in the Age of Black Lives Matter: Policing Black and Brown Bodies (Lexington Books, 2017). He is the lead editor of Beginning a Career in Academia: A Guide for Graduate Students of Color (Routledge, 2015) and Mentoring Faculty of Color: Essays on Professional Advancement in Colleges and Universities (McFarland Publishers, 2013). Mack has also published scholarly articles and book chapters. Anita Lewis, academic program assistant, Whitworth University, (509) 777-3270 or anitalewis@whitworth.edu.